Following my earlier article on a generic healthcare improvement strategy, I’m going to drill down to the next level and look at a related health IT strategy. We have discussed already that this needs to be seen in the wider context of healthcare reform and improvement, which requires an understanding of the complex adaptive nature of healthcare systems and the common patterns within. Those patterns include key themes such as people, process, information, technology, value .. so it should be assumed that strong leadership (esp clinical leadership) and an understanding of the healthcare process is a prerequisite to success with any technology strategy. The complexity of healthcare can be understood by looking at another key common pattern seen when looking across of the current healthcare information technology market, which I’ll simply label as A, B and C with a related graphic. On one side of the analysis, at least in simple terms, we have the most common state of healthcare economies , state A ( A Myriad of Siloes), a landscape of dozens/hundreds/thousands/tens of thousands of siloed systems.. depending on how broad you take a look at this. Each siloed system represents a different clinical team and their own unique processes as well as the technology they depend on, each and every one slightly different to the other , none able to easily share data with the other. This represents the current state of the industry from many vantage points and has come about by accident rather than by design, but the diversity represented here reflects the diversity of the complex adaptive system that is healthcare. In a typical hospital in the UK/EU/US it is not uncommon to have 100+ existing systems of this type. How have we arrived at that current state you might ask? Consider this.. the history of the medical profession and our training at medical school encourages medical doctors to be both independently thinkers and clinical independent. The science/art of business is not a regular part of the curriculum and certainly the language of business process analysis is an alien tongue. Therefore when clinicians consider their options without training in this field and/or get involved in the healthcare process analysis/ improvement efforts which triggers related information/technology requirements gathering… you wont be surprised that they routinely come up with what looks like an infinite variety of processes and requirements. This misses the deeper truth that there are deep recurring patterns in healthcare process that are generic and widely shared, but regardless, the current mindset begats the current health IT software industry -made up of thousands of disparate systems , that are all somewhat unique and do not interoperate. 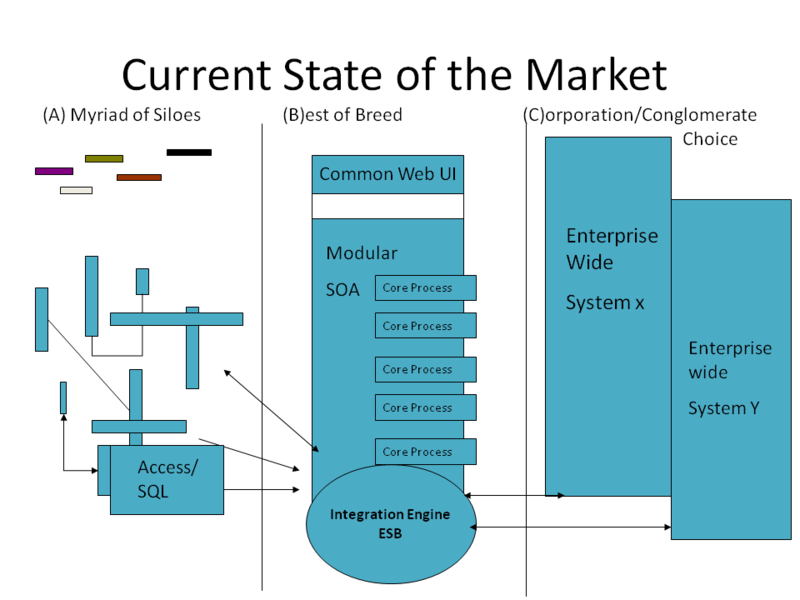 On the other side of the analysis we have state C, (Corporation/Conglomerate Choice) which related to the number of large enterprise wide systems (eg Epic, Cerner, VistA etc) on the market. In simplistic terms these represent efforts (several successful and some otherwise) to move an entire healthcare organisations and their processes to align with an “enterprise architecture” from one vendor. While these are usually marketed as a single coherent solution, in several cases these are conglomerates of technical architectures that have been acquired and marketed under one banner by one vendor. Some of these C options are certainly more coherent architecturally, though as their approaches are often “closed” they are difficult to scrutinise, a point we will come back to. In change terms a move to state C is a big ask, as it effectively means that the people and process elements of the healthcare organisation need to be moved and then firmly tied to the approach of that single vendor. Indeed to move from a point A to a point C is a huge cultural and organisational effort, a big bang and generally high risk, which is where the acute hospital care side of the NHS National Programme for IT got stuck and failed at scale. In the middle ground is what has historically been known as the “Best of Breed” approach, where a core number of organisational processes are supported by a related core number of supplier systems, eg Patient Administration, Order Communications /CPOE, ePrescribing, Clinical Document Management etc. For this to work, there are usually 2 other components in the mix here, an overarching common front-end (or “Portal”) and an integration engine ( or “Enterprise Service Bus”) which is the approach to integrating care around the patient taken in Leeds in recent years. In terms of organisational change a move from A to B is certainly easier than A to C, particularly if the integration of legacy data is built into the plans, which helps to ease the path of migration. This approach has proven to be a popular alternative to an outright move to option C and remains popular in many healthcare settings. The challenges of integrating disparate systems is not trivial of course and remains a real challenge. While there may be initial people and process advantages to move a healthcare organisation from A to B, in the medium to long term the question of how and when to move to C often remains, particularly as one aims towards deeper integration between the moving parts. Equally we are seeing that when healthcare organisations who have already made the jump to C want/need to then merge their existing Health IT efforts (eg VA & DOD) they are faced with the challenge of aligning two very different instances of the state C and so are also pulled towards an integration approach in the direction of C to B. As these limitations and advantages of integrating “best of breed” solutions via state B have become apparent in healthcare, a better understanding informed by lessons from elsewhere in the software industry is also emerging. One might label that “Best of Breed 2.0” or it is now more widely known as Service Oriented Architecture, i.e. a move to align the core services of the organisation with a related modular architecture , towards a more “plug and play” approach. In this regard we’re also seeing a general shift in industry towards “Software as a Service”, where suppliers compete on the service they provide, not the technology they lock you into. Healthcare as an industry is still in the early stages of moves between states A, B and C, though my sense of the patterns emerging is a general move over time towards B 2.0 .. which brings us to look towards the future, ie the promise of a related healthcare “platform”. More on the subject of platforms, particularly the prospect of an open platform for healthcare next time..